As soon as I had published my post yesterday, Solitary Snowdrop, I realized that there were some things about loneliness that I had neglected to include. Have any of you ever done that? Rene Yoshi, from Sweet Rains reminded of how the Holy Spirit brings comfort to us during loneliness, either directly from His presence or by sending someone our way with encouraging hugs. Joseph Elon Lillie of Lillie-Put pointed out that our loneliness is often more about the pain within rather than our circumstances without, and how that when we allow the Lord to address those issues, the loneliness usually subsides. Message From the Field shared a Scripture passage from Job 23 as a reminder that we are not alone when feeling so. Mikey of Hiseternalword shared a link to a wonderful post of his about loneliness called, Friend of the Lonely. I hope he forgives me for misspelling his name on my reply! Bill with Unshakable Hope shared his insights comparing religion vs relationship with God: “Religion = loneliness, relationship is fellowship.” So true! Jennifer with Fragrant Grace reminds us of the importance of prayer for those feeling lonely and rejected. I know for myself that it is all to easy to forget the pain of loneliness, and to neglect offering encouragement and prayer for those still hurting. my friend Jane, and so many others through their Likes. After reading your lovely comments, and receiving blessings from the encouraging Likes, I realized that there is yet one more source of loneliness. It can happen to any of us in the realm of blogging. I think back to a little over a year ago when I first began publishing my writing on Word Press. I had very few followers and little feedback. Having never had the courage until then to share my thoughts openly, it was disheartening. It left me feeling lonely and lost in the big world of blogging. At times, I still feel that way. How very grateful I am now to have more readers, and to receive such thoughtful comments as the ones I shared. I appreciate you, my lovely readers. One thing I have learned is that blogging is not just about throwing my thoughts out there; it is also about interacting with others. I have found so many wonderful sites and made many friends through blogging. It is through connecting with others that the loneliness felt in this arena dissipates. That said, though, the most important thing for us to remember is that God cares about everything we post, whether or not we receive any likes or feedback. He is pleased with our sacrifices of exalting His name. Even in blogosphere, we are never alone if we have Him. Never. *Please note: if you happened to read my post from yesterday, and offered any comments after my publishing today’s, I apologize for not including your thoughts. I do so very much appreciate you! Also, sorry for the infrequent posts. Sadly, I am still struggling with my neck and will do a post soon about my plans. 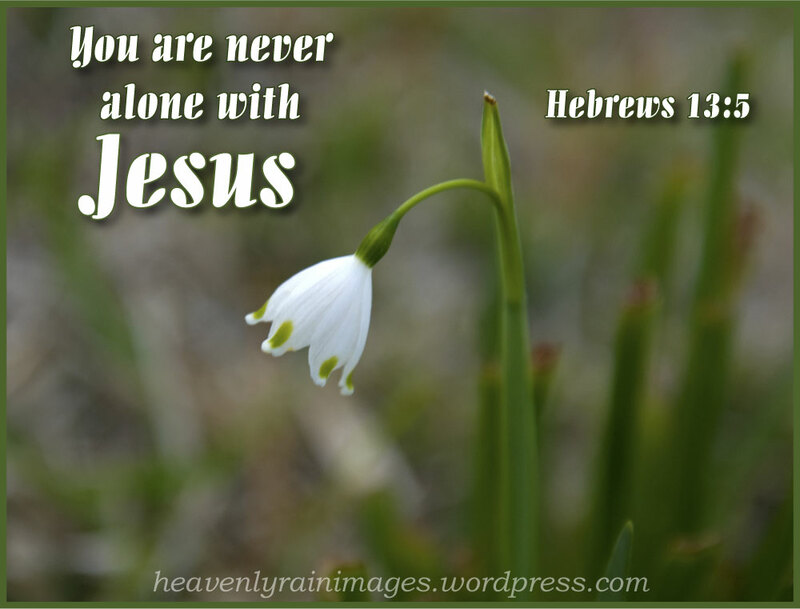 This entry was posted in Golden Oldie Hymns and tagged Christian blog, gospels, hymns, loneliness, Never Alone, No, photo, snowdrop on April 2, 2014 by heavenlyraindrops. Though we didn’t have any friends. .we still not alone because we have Jesus Christ. Remember one Hymn song Called ” What a friend we have in Jesus” 🙂 keep pray for you, sis. Have a blessed day. 🙂 You are welcome, sis. “Even in blogosphere we are never alone, if we have Him”… It is hard at times to pour our hearts out in writing blogs for all (or just a few) to see! I remind myself often that it matters not how many likes or comments I get, but only that I am obedient to write when He puts it on my heart to do so. Another hymn that came to mind is Jesus is all the World to Me…. When I am sad, He makes me glad…He’s my friend! Thank you for your beautiful post today! Blessings! Thanks Julie. OK. Just when I thought I had heard all the oldies, another one comes my way. Will have to Google the one you mentioned! Thanks and glad it was an encouragement. Your encouragement to all bloggers is refreshing and brightens my day! No doubt, God is hard at work with your words, What started as simply sharing your thoughts has become an outreach and ministry as you give Him all the glory. Thanking God for you! 🙂 Enjoy your day friend! Thanks very much. Blessings to you. This is such a lovely post on so many levels. We are to encourage one another! Like you, I’ve met some wonderful people via blogging and I can say I am better for it! B Blessed and continue your mission of hope, love and inspiration! Thanks Lilka. You are an inspiration to so many. Blessings back for all you do.